Ideal Credit Union has returned 10% of its 2018 earnings to members through its exclusive VIP+ Program, rewarding 4,390 VIP+ members with cash dividends between $50 and $600. The total payout for 2018 was $546,200. Since the program’s inception over six years ago, Ideal CU has paid out over $3.6 million to VIP+ members. 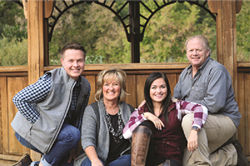 The Hennen family joined Ideal Credit Union in 2011 and two years later became one of Ideal’s VIP+ families. They’ve been paid a VIP+ dividend for going on six years totaling over $1,365.00. Ideal Credit Union has returned 10% of its 2018 earnings to members through its exclusive VIP+ Program, rewarding 4,390 VIP+ members with cash dividends between $50 and $600, which were automatically deposited into members’ savings accounts in January 2019. The total payout for 2018 was $546,200. Since the program’s inception over six years ago, Ideal CU has paid out over $3.6 million to VIP+ members. To learn more about Ideal’s unique VIP+ Program that rewards for being an Ideal CU member visit idealcu.com/vip.